Like all of my candle tins, there's a lovely story behind Emily's Parlour. When I was small, I remember Sunday Afternoon visits to my dad’s Aunt Emily. We were welcomed into her little parlour, the fire was lit and stories and chat were enjoyed over a pot of tea, served with thick slices of her home-made fruitcake. 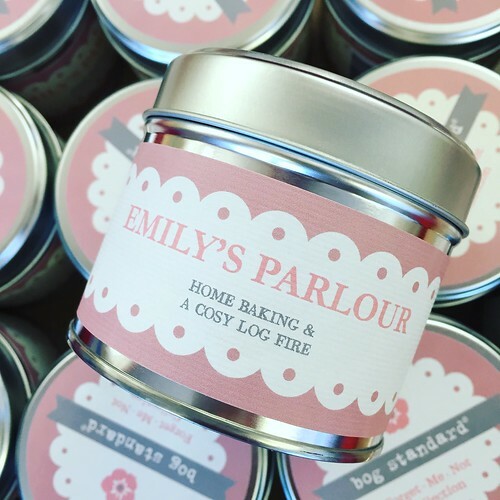 Emily’s parlour had a comforting smell of home baking and cosy fire and this is what inspired me to create the candle. The scent has a spicy, cinnamon accord with juicy apple and orange, hints of ginger and nutmeg, resting on a vanilla base, making it a lovely candle to burn at this time of year as the nights draw in. You can order Emily's Parlour on this link and remember, with all online purchases over £30/€40, UK/Ireland postage is FREE and you'll receive a FREE full-sized Hedgerow Soap!